Men’s basketball flirted with catastrophe as the regular season drew to a close, losing three conference games in a crucial stretch of the season. Fortunately, the team rebounded by demolishing Bowdoin in the final game of the season this Saturday afternoon to clinch a NESCAC tournament berth. With the win came a bit of history as well; with his 15 points during the game, Jordan Bonner ’19 became the 24th player in program history to score 1,000 career points. After dropping two games to Tufts and Trinity on Jan. 25 and Feb. 1, respectively, the Cardinals traveled to the untamed wilderness of western Massachusetts to take on Little Three rival, 19th-ranked Amherst. Although a non-conference game, this battle of bird versus prehistoric furry elephant was a high-intensity affair. The first half swung wildly back and forth, featuring ten lead changes. Down by five with 14 minutes remaining in the half, the Cardinals jumped ahead on a 14-0 run, sparked by a Jordan James ’21 layup and capped by an Austin Hutcherson ’21 three-pointer. However, Amherst stormed back with a 12-0 run of their own. The second half remained tight until a Mammoth 13-3 run gave them an eight point lead with just 10 minutes remaining in the game. The Red and Black managed to claw back, however, finally retaking the lead with just under four minutes left after Bonner converted a three-point play. Three minutes later, a Hutcherson field goal put Wesleyan ahead by one, 60-59. Unfortunately, this game was decided at the free-throw line. Amherst hit both shots with 11 seconds remaining, and didn’t allow the Cardinals a good look at a buzzer-beater attempt. 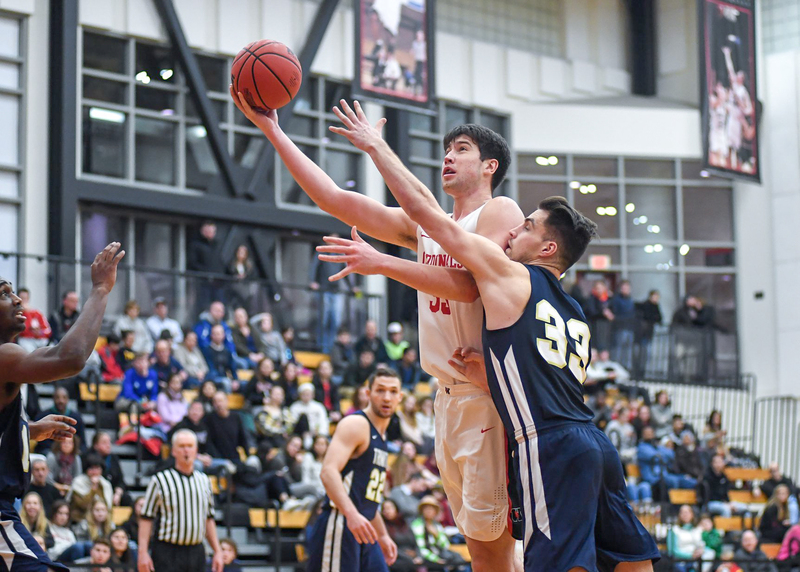 With the 61-60 loss, Wesleyan’s seven-game win streak against Amherst was snapped, and the conference-leading Mammoths improved to 18-3 on the season. The Cardinals, on the other hand, fell to 15-7. Returning to Middletown for their penultimate game of the year, the Cardinals were caught off guard by an offensive explosion by Colby in the first half. The Mules led 54-28 at the half, fueled by lights-out shooting from beyond the arc (54 percent) that lead to a 19-0 run. The Cardinals responded nicely to a tough first half, embarking on a 15-2 run that was wrapped up by a corner three from Sam Peek ’22. Hutcherson was the driving force behind the Cardinal comeback, scoring 21 of his game-high 26 points in the second half as Wesleyan pulled to within one with four remaining. Sadly, Colby iced the game with back to back threes, ultimately emerging victorious over the Cards by a score of 90-80. As a result, Wesleyan’s bid to qualify for the NESCAC tournament got pushed to their final game of the season, at home versus Bowdoin. The Polar Bears started out the game strong before going ice cold, hanging with the Cardinals until a 13-3 run put the Red and Black ahead by nine at the half. With four minutes left in the first half, Bonner nailed a three, putting him at 1,000 career points. Wesleyan dominated the second half, opening on a 15-4 run to take a 20 point lead. Hutcherson was simply spectacular in the half, dropping 24 points on 9-10 shooting. The New York City native finished with a career-high 37 points, surpassing the 36 he had already put up this year. Bonner finished with 15 and six rebounds on his special afternoon. Wesleyan cruised past Bowdoin, 91-65, to finish the season with a 16-8 overall record, a 6-4 conference record, and a NESCAC playoff berth. Head coach Joe Reilly had high praise for Bonner after his historic game. In addition, Reilly likes his team’s chances in the conference playoffs, but also emphasized how tightly competitive the NESCAC has been this year, where only one conference win separates the top-seeded Mammoths from the three teams (Trinity, Wesleyan, Williams) currently tied for fourth. Reilly also spoke of what impact the late-season losing streak had on the Cardinals and what steps they could take to improve before the playoffs start. Wesleyan is slated to play in the NESCAC quarterfinals at 3 p.m. next Saturday, but won’t know its opponent, venue, or seeding until the conclusion of the Amherst vs. Hamilton game this Tuesday night. In any case, the Red and Black are ready and willing to put it all on the line in this year’s postseason.